My last home had a lot of tall mature trees and every fall I would have to spend a few hours on a ladder cleaning out the gutters and downspouts. It was always a messy and cold job digging out old leaves, sticks and the occasional tennis ball. I like to spray them with the hose to wash all the debris out making sure rain and snow would not get backed up. A friend had installed some gutter guards and had about half of a box left over and gave it to me. I spent another $80 at the local big box store to finish the job. I did not have to get up there and clean the gutters again. One of the first things I did when I moved into my current home was clean the gutters and install the same guards. They work great and for $140 I won’t have to worry about it. I check them every so often but they stay in place and keep the gutters clean. These are available in brown and white and they are easy to cut with heavy duty scissors or a pair of tin snips. Each section is 3 feet long and they fit 4” or 5” gutters. You can them by the box and individual pieces. It just depends how many feet you will need. 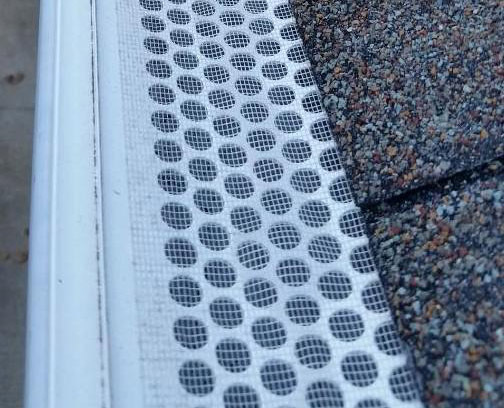 About 1/3 of the guard slides under the asphalt shingles and the other side clips to the lip of the gutter. No screws or drilling needed but keep a hammer with you to tighten up loose nails. I’ve used a dab of caulk to hold some pieces in place and it last for years. I have found these to be very easy to install, available at most home improvement centers, reasonably priced and they work great!